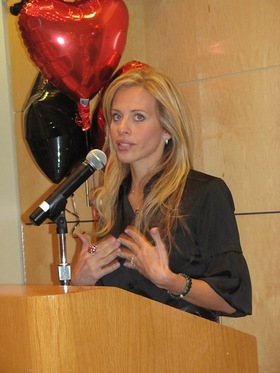 Last week, Dina Manzo of The Real Housewives of New Jersey and Project Ladybug announced the launch of Julien’s Project Ladybug Fund at Memorial Sloan-Kettering Cancer Center with an intimate cocktail reception. Project Ladybug, a non-profit organization established to raise hope and funds for children with cancer and their families, is extending their reach to Memorial Sloan-Kettering in the form of Julien’s Project Ladybug Fund. The fund will honor Julien Collot, an inspirational young boy who, after suffering from adult leukemia and receiving two bone marrow transplants, was diagnosed with Graft vs. Host disease after a complication from his last transplant. Julien’s Project Ladybug Fund will work to provide assistance to the children and their families in the New York area faced with the inevitable hardships brought on by a cancer diagnosis. Memorial Sloan-Kettering is the world’s oldest and largest private institution dedicated to prevention, patient care, and education in cancer. Its scientists and clinicians generate innovative approaches to better understand, diagnose and treat cancer. Its specialists are leaders in biomedical research and in translating the latest research to advance the standard of care worldwide. Dina Manzo was joined by Julien’s mother, Jacqueline Collot, who will help oversee use of the funds, and Memorial Sloan-Kettering staff members to welcome Julien’s Fund to the Cancer Center.